ProJet 5600 Series – 3D Rapid Prototyping, Inc. Dozens of MultiJet material choices — This ingenious 3D printer solution simultaneously prints and blends both flexible and rigid photopolymers within the VisiJet® family of materials. This is done layer-by-layer at the voxel level, in one part and in a single build, to achieve superior mechanical properties. Additionally, VisiJet rigid plastic, elastomeric and composite materials are engineered for performance with varying degrees of flexibility, material transparency and differentiated shades in one part. Exceptionally high throughput — The ProJet MJP 5600 delivers ready-to-use parts at print speeds up to 2x faster than similar printers. 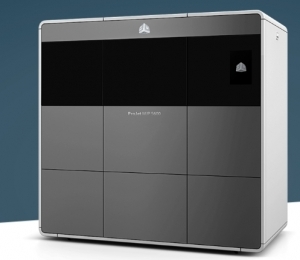 This MultiJet 3D printing solution can quickly output a full build and offers a cleaning method that’s up to 4x faster than other processes thanks to automated post-processing. With a high capacity and over 50% larger build volume than other MultiJet printing machines, you can print parts up to half a meter long—or several smaller parts—in a single build.